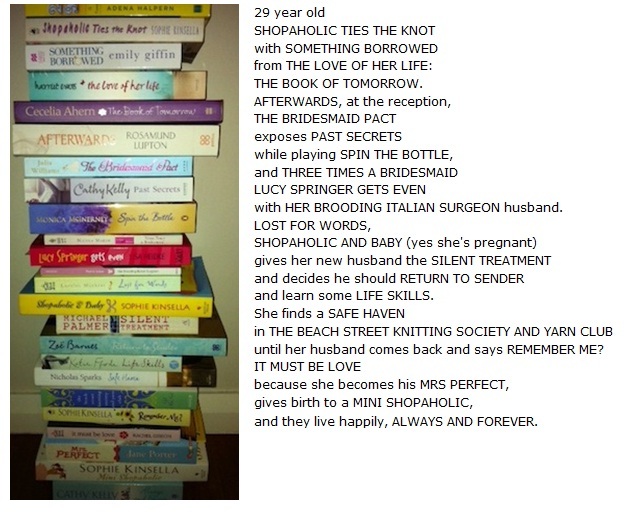 My poem made from book titles! As an avid reader, writer, and creative person in general, (with a slight, okay… a fierce competitive streak), when I saw a contest for making a poem out of book titles I just had to enter! Thanks to my writer buddy (and collage poet) Diane for sharing the link to the contest, and to Janet Reid for organising it and reading through all the entries. I didn’t expect to make the top four finalists, so that was a nice surprise!! You can see the results and the winning poem here. So why not give this a go yourself? C’mon, have some fun and show me what you end up with! Posted on September 29, 2011, in Book Covers, Excerpts, General, Writing and tagged books, competitions, contests, craft, poems, poetry, something borrowed, writing. Bookmark the permalink. 4 Comments. Love it – very creative! Great minds huh! You should try making one too, perhaps a sequel to mine!